‘SCHWUH-EEET’ is an exploration of the polarity of our historic and contemporary musical traditions as presented through their contrasting dance music. Each of the four movements is based in some way upon a movement of a Baroque suite; namely the Allemande, the Bourreé, the Sarabande and the Gigue. The manner of their presentation, however, is contemporary – both in the timbre of the instrumentation, the electronic elements, the various rhythmic pulses... The piece is intended to inhabit a world part traditional, part contemporary-classical, whilst exploring the dichotomy between these and our popular culture. It seems to me that the friction of this contrast, both across time and within our own culture, is remarkable for its peculiarity, and fertile creative ground. Schwuh-eeet was a finalist in rarescale’s Tenth Anniversary Composition Competition in 2013. 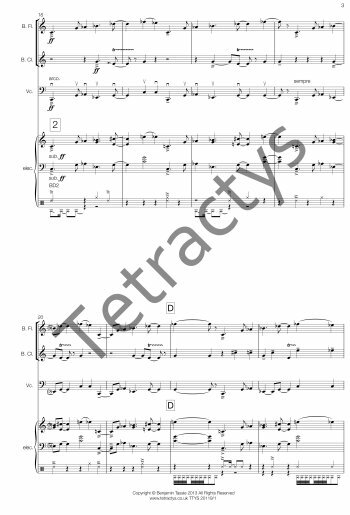 It was premiered by rarescale (Carla Rees, bass flute, Sarah Watts, clarinets, Corentin Chassard, cello and Michael Oliva, electronics) in the Amaryllis Fleming Concert Hall at the Royal College of Music, London, on 27th September 2013. A recording of the work will be available from Autumn 2015 on rarescale records.